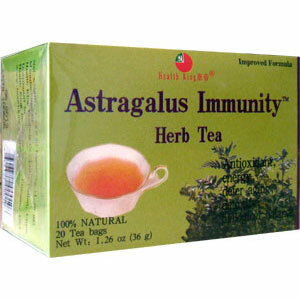 Astragalus Immunity Herb Tea, flavored with jasmine flower, is made of wild astragalus from the pollution-free area of northeast China. Astragalus contains polysaccharides, flavonoid, saponins, choline, betaine, folic acid, amino acids, vitamins, and 14 minerals: selenium, zinc, iron, etc. As an adaptogen, it helps the body regain balance and is the most popular herb in Chinese medicine for its tonifying, diuretic, cardiotonic, vasodilating and other useful qualities, to help maintain normal functions of the liver, lung, kidney, stomach and heart, to boost energy, defer aging, detoxify, etc., to bolster white blood cells growth, support the immune systems, and to promote the effect of other herbs, and help reduce side effect of chemotherapy and radiation. Tonifying, diuretic, cardiotonic, vasodilating and other useful qualities, to help maintain normal functions of the liver, lung, kidney, stomach and heart, to boost energy, defer aging, detoxify, etc., to bolster white blood cells growth, support the immune systems, and to promote the effect of other herbs, and help reduce side effect of chemotherapy and radiation.